Grab the Mini Desert Buggy and get ready for sand, sun and a whole lot of fun. Everything you need is right in the box—unless you want to customize your vehicle, there is nothing more to buy, ever. The Mini Desert Buggy has it all. A sand-rail frame, roll cage and chrome wheels give it the realistic details of its full-scale counterpart. 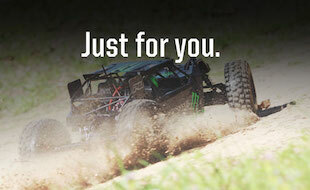 Front strut-style shock mounts will ensure bumps, jumps and hills are more fun than ever. And 3-wire connections come standard for all electronics, so upgrading and maintaining your buggy is incredibly easy. On top of all that, the Mini Desert Buggy comes with a rechargeable battery pack and powerful motor. And to make sure you have flawless, interference-free control, we have included a Losi® Radio System with Spektrum™ 2.4GHz DSM technology. On the street or off-road, this buggy is off the hook.